Sabudana/Sago kheer is a family favourite and is made very often at home. Especially when all of us go through a bout of excess body heat (which runs in the family :D), sabudana kheer helps combat the effects. It’s simple to make and takes no time. Bring a cup of water to boil and add washed sabudana. Bring to a boil and cook till sabudana is half done. Add boiling milk and let sabudana cook completely. Add sugar, cardamom powder and saffron. Bring to a boil, add more milk if required. Heat ghee in a small pan, add the cashews and raisins. Saute till golden brown. Add this to the kheer and mix well. Serve hot or cold. 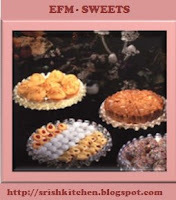 I am sending this over to Srilekha's event "EFM Theme- Sweets" over at Me and My Kitchen. Will be catching up with each of your blogs soon. Have a fabulous weekend! Good to see you back. Kheer looks lovely, reminds me of home.. I have never had this dessert before. Am just geared up all set for our India trip..Kheer looks too good! Welcome back...looking fwd to posts about the food you had in India. You did pictures, didn't you? missed your postings! this sabakki payasa (thats what we call it) is our family fav too.. Very good to see a fresh posting on you blog Namratha!! I have been waiting for quite some time now! So good to know that you are back from India.. We are right now vacationing in Atlanta..was thinking of you the other day! Cheers and will hope to see posting more often!! Namaratha, Glad to see you back,it is so lonely after you come from India.The sabudana kheer is also my family's favorite.Thanks for reminding me. Welcome back and wow what a stunning dessert! Good to see u back dear... Hope u had a wonderful time. The sabudana keer is very yummy! pic is very beautifully captured! it is my favorite. Great to have you back nams:) sabakki paayasa is my fav!! looks delicious..